How much time should you dedicate to your sport on an annual basis? How can student-athletes prevent a “burn out”? How can you minimize the pressure on your student-athlete? Find out all of the answers to these questions in this week’s episode! – How to manage the student-athlete’s dedication to a particular sport, especially at a young age. 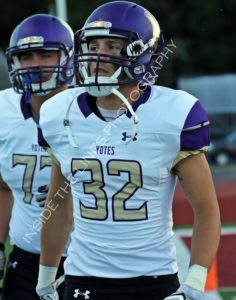 We would like to congratulate Tristen Alesi on his commitment to the College of Idaho. Here’s Tristen’s recruiting story and interview after his commitment. Good luck as a Yote! The process was pretty easy going. The hardest thing about everything was the waiting game of talking to coaches and seeing if they would reply to you and how long it would take. I am attending the College of Idaho and I chose them because I like the atmosphere here. The coaches have their head in the right place in changing the program into one of the best NAIA programs in the league. SportsForce helped me contact lots of colleges in a small amount of time and getting my name out there. Creating my highlight videos and sharing my stats was huge in my recruiting process. Start early in the recruiting process. The sooner coaches know your name and you develop a relationship, it puts you in a better place for being recruited and being reached out too. I am very excited for my future in college! I am saving thousands of dollars that otherwise would’ve been spent on college and will not be in debt out of college. Yes, but be aware that the process takes time and since college coaches have restrictions on expressing their direct personal interest in you, you may not have as much personal interaction with a coach right away, but if you trust the process, it will be worth it in the end. Where do you fit from an athletic standpoint? How do you determine which events are right for you? What do you need to know before you’re exposed to recruiters? We would like to congratulate Garrett Hastings on his commitment to the University of Kentucky! 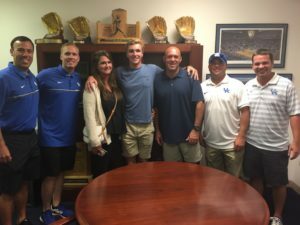 Here is Garrett’s recruiting story and intervew after his commitment. Good luck as a Wildcat! 1. Share your recruiting story and status. It’s a long patient process, I learned a lot of how coaches think and what they are looking for. Even the small things matter because you never know when you have the opportunity to make an impression. Education, more specifically Ryan Thompson. He took the time and made the efforts to walk us thru the process of recruiting and outlined ways that helped me stand out to schools. He taught me about the mental and physical ways that I needed to continue to improve. 4.What advice would you give to other players and parents with the recruiting process? Start earlier than you think, developing a plan of a group of target schools. Try to get on their radar, then keep them updated on your accomplishments and upcoming tournaments. Use your own language and talk to them straight the coaches seem to appreciate that. You definitely want to provide a highlight video long enough to outline/show your strengths and update it over time. Very excited, the opportunities for me are endless. I would, they have an understanding of the process, templates and the data to develop communication for schools across the country and all athletic and educational levels. But be prepared as a family to make an effort to work together and research.